After a three-and-a-half-year struggle, workers in Cablevision’s first unionized shop finally win a contract. Clarence Adams has spent a lot of time on his phone after work over the past three-and-a-half-years. The Cablevision technician, who has worked fifteen years at the cable and Internet provider, has been part of the organizing committee trying to form a union and get a contract for his Brooklyn division since 2011. At times, it seemed that the struggle would never end. Cablevision has fired, then rehired, workers when the union put pressure on the company or the National Labor Relations Board (NLRB) stepped in. It has threatened the workers and attempted to decertify the union. It orchestrated false union votes and bestowed raises on all but the unionized workers. And it did all this—what City Council member Brad Lander described as a “brutal litany of unfair labor practices”— while dragging its feet at the bargaining table. Those long hours and hard work have finally paid off for Adams and 261 of his coworkers in Brooklyn, who voted on February14 to accept their first union contract. That contract, according to the Communication Workers of America (CWA), will include raises of between 10 and 25 percent over the next two years for most of the workers, with some of them getting as much as 34 percent. They’ve also won just-cause provisions and grievance and arbitration procedures, as well as a few limitations on the company’s ability to use contract workers. After more than three years of battling the union, it’s not clear exactly what brought Cablevision and its owner, James Dolan, whom Michael Powell at The New York Times called “a consummate 1 percenter,” to the bargaining table. It is possible that he feared public protests around the NBA All-Star Game, which took place February 13 through 15 at Madison Square Garden, which Dolan also owns, along with the New York Knicks (as well as the Rangers hockey team). Ongoing legal pressure probably played a role as well; in December, an administrative law judge with the NLRB ruled that Cablevision had illegally given raises to workers to convince them to vote against the union, and illegally fired twenty-two pro-union workers in 2013. There was also vocal public support for the workers, including from a new mayor and City Council majority. Or maybe it was because the workers just wouldn’t give up. CWA had been trying to organize at Cablevision in the greater New York area for about twenty years, according to Dubnau, and had never succeeded. But, as the cliché goes, something was different this time around. For one thing, in 2011, when the Brooklyn workers began their campaign, CWA was in the middle of running a high-profile strike at Verizon in New York. Dubnau recounted how several of the Brooklyn workers came into the office of CWA Local 1109 and asked for union cards. They took the cards and left, and no one at the union heard from them again until they returned, with a majority of the workers having signed the cards. The workers formed an organizing committee which took on the responsibility for educating their colleagues, convincing them to sign cards and wear pro-union wristbands in public, and preparing them for the inevitable anti-union captive audience meetings. Courtney Graham, who has worked twenty-one years as a Cablevision tech, explained that money originally wasn’t at the center of the workers’ demands. Safety concerns—a lack of training on new equipment, and a lack of protection when they worked in dangerous areas—and a clear process for promotions and complaints were more important. Then, while they were building support for their struggle within the company, Occupy Wall Street sprang up in the financial district. 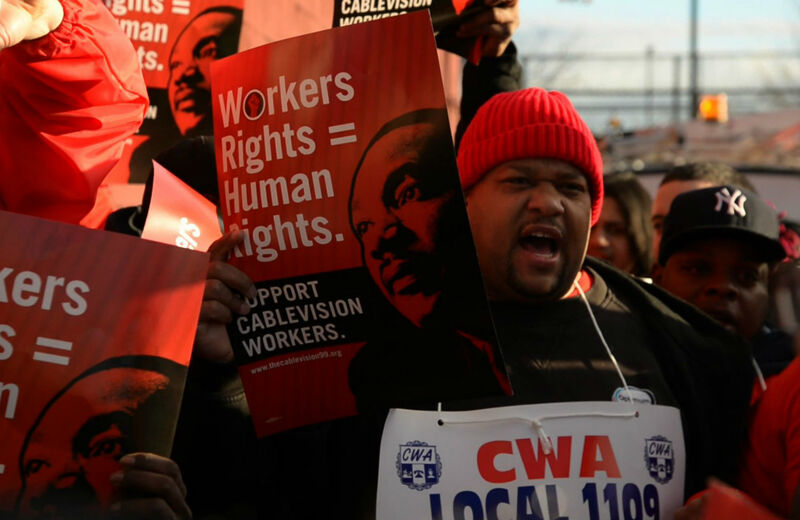 The language of the 99 percent and the 1 percent permeated the Cablevision workers’ campaign; they also infused their organizing among the workers, a majority of whom are people of color, with a racial justice lens. “All that, I think, allowed us to articulate a really clear vision of what a union is,” Dubnau said. They won their union vote, 180 to 86, on January 26, 2012. “I’ll never forget that day,” Thompson said. But as so often happens to workers who think the struggle is over once the union election has been won, their fight was just beginning. While CWA began to get calls from workers across the company wanting to join, Cablevision had no plans to give up. Workers in the Bronx, who had been supportive of the union, turned against it when Dolan himself turned up just before their vote to promise them a raise. Then, Cablevision awarded big raises to workers across the company—except for those in Brooklyn. The raises ranged between $2 and $9 an hour, averaging out to about 14 percent across the board. “Ever since I’ve been in this company there has never been a pay raise of that size, ever,” Adams said. The fight grew even uglier in early 2013 when Cablevision fired twenty-two of the Brooklyn workers after they showed up outside the door of one of the company’s executives, seeking an audience. CWA filed unfair-labor-practice charges. But before the NLRB could rule, the workers were reinstated, thanks to a vigorous campaign by workers and their allies. A week after the firing, community members, clergy and most, famously, nearly all the mayoral candidates at the time, including then–Council Speaker Christine Quinn and now-Mayor Bill de Blasio, arrived at Cablevision’s headquarters to walk the twenty-two, arm in arm, back onto the job. Supporters also flooded Cablevision with calls asking them to reinstate the workers, and threatening to cancel their cable service if the company did not. The workers voted 129 to 115 to back out of the union—proof, according to full-page ads taken out by Dolan, that the workers didn’t want CWA anymore. But in a complaint filed in November, the NLRB accused Dolan of making illegal threats and promises to the workers in that meeting. One month later, the NLRB administrative law judge ruled that Dolan and other executives had engaged in unfair labor practices, including intimidating workers and illegally firing the twenty-two. But even after the hearing, right up until last week, it appeared that the stalemate at Cablevision would continue. Thompson’s music and willingness to speak up have undoubtedly contributed to the fact that his colleagues do have a job and a contract. It is a somewhat cruel twist to the story that he does not have his job back yet. Cablevision says Thompson was fired for being late to work and making calls on a company phone; he says he was fired for making that statement. The labor board will decide—the consolidated complaint that includes his firing, as well as charges that Cablevision “failed and refused to bargain in good faith with the Union,” will still go forward. Meanwhile, he’s temporarily working with CWA as an organizer. For him, the dots are easy to connect between the battle for respect at work and the call for justice for Garner. When his medical plan at work was changed, he says, his asthma inhaler jumped in price from $7 to $50. “I’ve got to breathe,” he said, his words echoing Garner’s famous plea. “A lot of people are recognizing what’s going on, I attribute a lot of that to the Wall Street movement. It’s bringing a lot of people together,” he added.